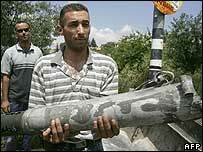 Even to my untrained eye, a Katyusha rocket is a world apart from a Qassam. A Russian journalist fished the broken tail of one, rather sheepishly, from the boot of his car, when I wondered aloud if any of the bangs and whimpers all around us were actually caused by incoming fire. "We found it over there..." he admitted, nodding at a wooded hillside. The Qassams regularly fired by Palestinian militants in Gaza at Israeli towns have inflicted some casualties, but are crude, blunt instruments - rusty iron pipes welded together with engines and fins in secret workshops in Gaza. What was left of this Katyusha betrayed a sleek, professional weapon - slimmer, steelier, more lethal than its homemade brother. The Qassams mostly needle the Israelis, like pinpricks in the ankles of a giant, taunting him to stamp back with his big, US-issue army boots. The Katyushas are like poisoned arrows. They drive him mad. Driving through sleepy mountain villages in northern Galilee this week, along Israel's border with Lebanon, I began to understand Israel's fear. Different Arab peoples in this region are vying with one another to become Israel's greatest enemy. By killing eight soldiers in a border raid and its aftermath on Wednesday, and taking two more hostages, Hezbollah has leap-frogged Hamas to take pole position in a gruesome competition: who can damage the Jewish state the most. Television pictures of the burnt-out Israeli military vehicles, ambushed by Hezbollah on the border, the discarded military equipment lying on the tarmac and the pools of Israeli blood, have already become iconic for both the Israeli and Palestinian public. For many Palestinians, there is proof at last that the state which has taken 78% of what they regard as their land since the foundation of Israel in 1948 - and every day seems to take a little more - can actually be beaten. Not in the overall war perhaps, but in an isolated skirmish. For the Israelis, the death of its soldiers, and the steady rain of Katyushas, is a national insult - a declaration of war. Their air attacks on Beirut, on southern Lebanon, and on the roads leading to Syria and their constant artillery shelling of what they believe are Hezbollah positions, have escalated the conflict. The giant is kicking out, then landing punch after punch on long-suffering Lebanon. We took a strange route to the Lebanese border. May 1983: Israel pulls back, but keeps "security zone"
In fact, we left Jerusalem that morning without the slightest inkling that we would watch a bloodshot moon rise over the Golan heights that night. We were on our way to the northern town of Jenin - to investigate reports that Palestinian militants have managed to build Qassam rockets there too - when the phone rang to divert us towards Lebanon. Driving down Highway 60 - the spine of the superstructure Israel has built on the West Bank - one understands the resentment and the sense of oppression the Palestinians feel. Smart, middle-class Israeli settlements have sprung up on virgin hillsides, watered by springs often diverted from Palestinian villages. Tunnels and fences have been erected by the occupier to keep Palestinians away from Israeli roads, Israeli settlements and Israeli soldiers. Increasingly confined by barriers and checkpoints into little reservations, it is little wonder that Palestinians applaud Sheikh Nasrallah, the spiritual head of the Hezbollah, when he calls for the release of some of the thousands of Palestinian prisoners held by Israel. "Only violence pays," has been the lesson often taught both by Israel, and by the many militant groups who oppose her in the Middle East. And pupils on both sides have graduated with honours. In Jerusalem I met my old friend, Dov, who works for the Jewish People Planning Institution - a think tank trying to forecast and defuse new sources of danger to Jews the world over. "As we try to protect the Jews in Israel from attack," he told me, "we're increasingly afraid of attacks on soft targets abroad - like Jewish schools and synagogues in Europe and beyond." One of his institute's initiatives is to try to influence young Muslims in France, whose grievances are sometimes expressed in anti-Semitism and who drew world attention during last year's riots in the suburbs of French cities. "On your travels, you must often be asked to justify Israel's policy towards the Palestinians?" I asked, innocently. "We don't engage with that question at all," he said. "We just ask people to tell us about their own lives, their own problems." I disagree, as gently as I can. Until there is a broad peace agreement in the Middle East, it seems to me, not imposed by Israel, but agreed by all sides, I fear his people, and for that matter mine, will be the targets. In the last village before the highway, oblivious to the danger of rockets, a young man pushes a cart loaded to the sky with white eggs. In the other direction come lorries, loaded with shells, for Israeli tanks to launch into Lebanon. From Our Own Correspondent was broadcast on Saturday 15 July, 2006 at 1130 BST on BBC Radio 4. Please check the programme schedules for World Service transmission times.